Dario Zanatta’s bold move to uproot from his native Canada is already beginning to reap rewards. After almost four years in the youth ranks at Vancouver Whitecaps, the teenage attacker felt the urge to head to Europe in order to progress his fledgling football career. His leap of faith in deciding to leave the Caps, where he was highly regarded and relatively close to his home city of Victoria, was vindicated in August when, following a couple of trial periods at Riccarton at the end of last season and the beginning of the current one, Hearts handed him a two-year deal. Signed primarily as a development player, Zanatta’s promising form for the Under-20 team was recognised when he was named as a substitute for the first-team’s trip to Dundee United last month. The Canadian youth internationalist remained on the bench for the victory over Ross County the following week and then got his taste of first-team football when he was introduced in left midfield for the final 20 minutes or so as Hearts coasted towards a 4-0 win over Partick Thistle at Firhill last weekend. “I didn’t expect to get on but after I saw the way the game was going, I was hoping I might get the opportunity because 3-0 up is a good chance to get a younger player on,” he told the Evening News in his first interview since arriving in Edinburgh. “It was quite sudden because Gavin Reilly was warming up before me [ready to replace Osman Sow], but Sam Nicholson went down with cramp so the gaffer looked at me and said ‘you’re going on’. This early taste of first-team action has come as a welcome boost to a player who left the comforts of home behind to try and better himself. “I decided I wanted to leave my old club and find a club in Europe that could help me progress. My agent got in contact with Hearts and arranged for me to come on trial at the end of last season. Hearts thought I did well and invited me back for pre-season. I was here for about three weeks and then they offered me a full-time deal. “I was open-minded about which country I went to but the fact I’m in an English-speaking country has made me feel less foreign. I did some research and saw that Hearts had quite a few younger players who had come through their youth ranks, so I knew that I would have a better chance of getting close to the first team here than at other clubs I’d looked at. The Hearts-supporting family Zanatta lives with have also helped him acclimatise to Edinburgh life. “Living in digs helps you settle in and makes it easier to get used to the area rather than just being thrown into living by yourself,” he explained. 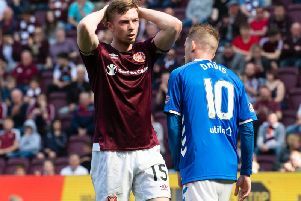 Zanatta, who crossed paths with former Scotland striker Kenny Miller at Whitecaps, hopes to remain in the Hearts squad for tomorrow’s Premiership visit from Hamilton. A goal in the Under-20s’ 2-2 draw with Falkirk on Monday will have done his chances no harm in that regard.